Trump Says U.S. Military Is 'Locked And Loaded' To Deal With North Korea : The Two-Way North Korea has threatened to send missiles toward Guam. In his latest tweet about the isolated regime, President Trump says, "Military solutions are now fully in place, locked and loaded." 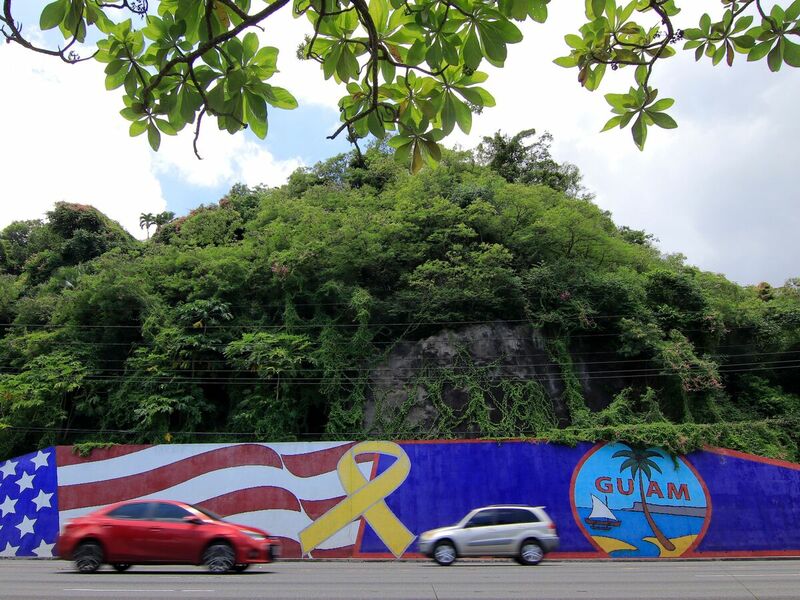 Afternoon traffic passes in front of a wall painted with the flags of the U.S. and Guam in the Tumon district on the island of Guam on Friday. The island has become a talking point in the rhetoric coming from President Trump and North Korea. The statement, made via Twitter, comes one day after Trump wondered whether he had been stern enough in talking about North Korea earlier this week, when he promised to meet Pyongyang's threats with "fire and fury." In response to that fire and fury threat, North Korea said its military is preparing to conduct a test firing of four missiles that would fly over Japan and land in waters near the U.S. territory of Guam. The plan could be enacted by mid-August, the Korean Central News Agency said. Hours after Trump tweeted his locked and loaded comment on Friday, he retweeted a U.S. Pacific Command message stating that its B-1B Lancer bombers on Guam "stand ready" to carry out a mission "if called upon to do so." Speaking from Bedminster, N.J., where the president is on an extended working vacation, he said that if North Korean leader Kim Jong Un "does anything with respect to Guam or anyplace else that's an American territory or an American ally, he will truly regret it and he will regret it fast." Later he added that it would be "big, big trouble in North Korea" in the event of such an attack; however he did say that he thought Guam would be "very safe, believe me" and said he hopes "it will all work out." It would take around 14 minutes for a North Korean missile to arrive in the area, officials in Guam said on Friday, as they discussed their plan to use sirens to alert the public in the event of a launch toward the island. Reporting from Guam, NPR's Elise Hu says that leaders there are telling residents not to panic. "Guam is located in a key position in the Pacific for the U.S. military. Guam Gov. Eddie Baza Calvo says he coordinates with Homeland Security and the U.S. military on preparedness procedures. "But Guam's former delegate to Congress, Robert Underwood, says he is concerned the 160,000 people of Guam are being forgotten with President Trump's escalating rhetoric toward North Korea.
" 'So, are we just like cannon fodder? Are we just extras, are we just not part of the equation?' Underwood asked. "Guam's leaders say the threat level hasn't gone up following North Korea's latest threat."